Growing up, my favorite treat in the Easter basket was, hands down, Reese’s Peanut Butter Eggs. Oh. My. Word. I LOVED those things. Somehow the egg version was even better than the peanut butter cups. I suspect it’s because there is less “ridgy” chocolate perimeter, and more peanut butter filling. Although I plan to take my Sunny Lemon Cupcakes to our family gathering on Sunday, and they really are the perfect springtime dessert, it just wouldn’t feel like Easter without some kind of yummy-filled chocolate egg. I’ve had the idea for these nutty little eggs dancing around in my noggin’ for a few weeks, but hadn’t had the time to play around with it. I finally had some time to experiment today, and I’m practically jumping up and down with excitement at how good they turned out. I decided to go with a slightly different flavor combination than the usual milk chocolate/peanut butter filling for these little gems. This is a fancier sort of chocolate egg, not something to stuff in your face whilst digging around the jellybeans for another. Instead, you’ll want to savor each little nibble. 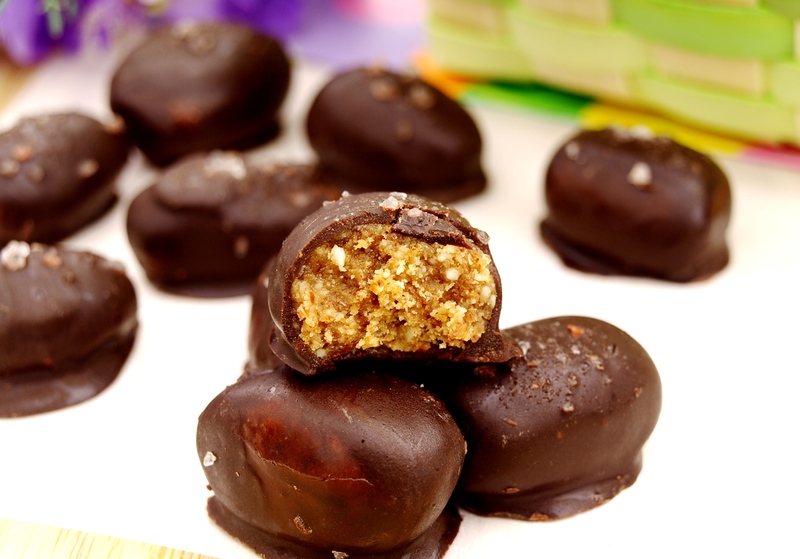 The chocolate is a super easy blend of cacao, coconut oil, and maple syrup, while the filling is simply almond butter, almond meal, coconut oil, salt, and maple syrup. If you wish to make a more Reese’s-like egg, by all means, go with peanut butter in place of the almond butter. Don’t worry, I tried that too, and it was delicious! 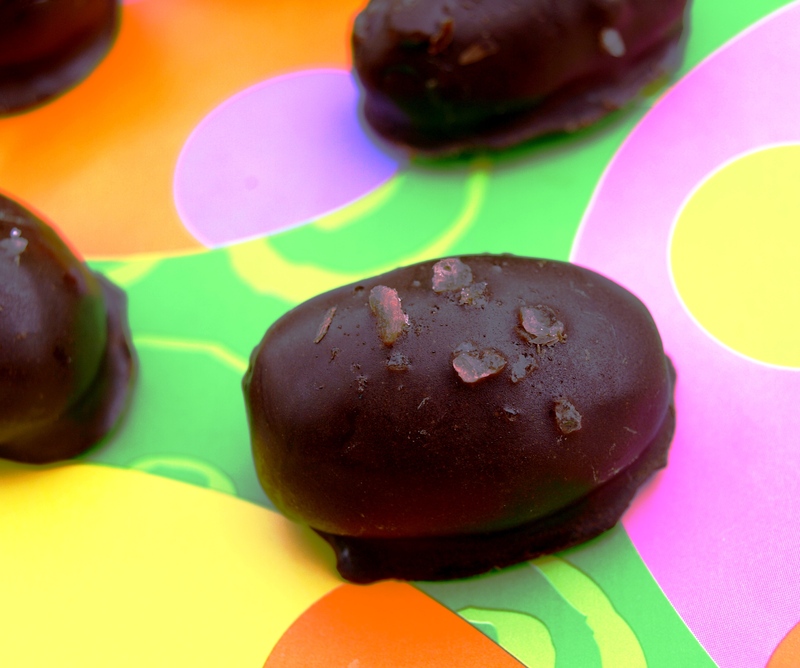 You don’t need a special candy mold to make these chocolate eggs. The results are perhaps a bit rustic, but I actually think that just gives them more character. After all, these are hand-crafted chocolates. These are so easy, you guys! I think they taste even better than a Reese’s, plus they have simple ingredients… no corn syrup solids, GMOs, TBHQ, or PGPR, or any other weird acronym-ed ingredients you didn’t know were lurking in your favorite commercial peanut butter egg. Also, they are free of eggs, dairy, or refined sugar. 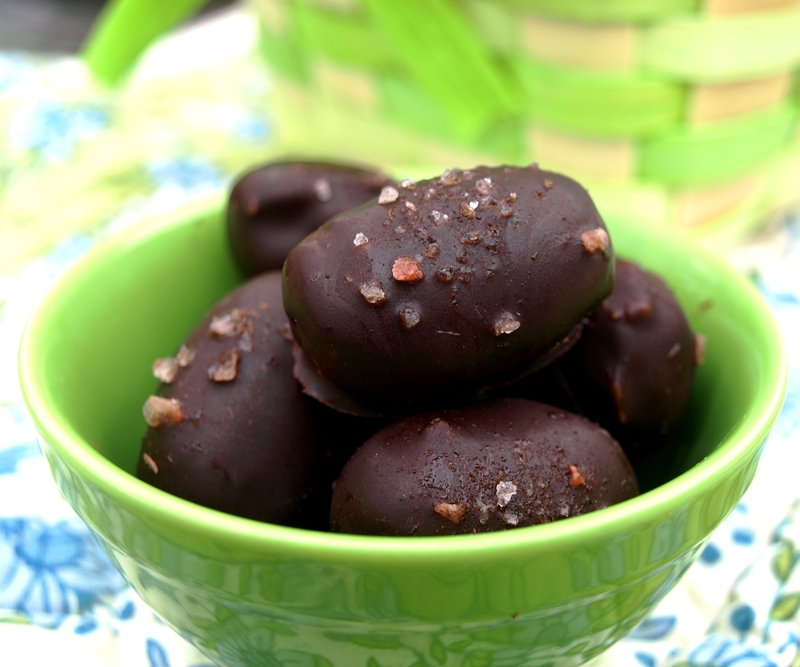 If you’re looking to make an easy last minute Easter treat, these Salted Dark Chocolate Almond Butter Eggs are the perfect choice! Actually I think they’d be good any time of the year. I hope you give them a try! 1. Add the nut butter and coconut oil to a small pot and warm over low heat until coconut oil is melted. Remove from heat and stir in the maple syrup or honey. Add the almond flour (or almond flour/oat flour combination) and salt and mix well. It should form a very soft dough. Taste for sweetness, and add more sweetener if desired. If it seems too runny, add more almond flour or oat flour, a little at a time. It will firm up more when you cool it. Transfer the mixture to a glass container with a lid and put it in the freezer for about 20-30 minutes. 2. Remove filling from freezer and, using a teaspoon, scoop out a small amount and use your hands to roll it into an egg shape. Place the eggs on a parchment lined tray or plate and transfer back to the freezer for about 5 minutes. 3. While the eggs firm up, make the chocolate coating. Melt the coconut oil over low heat just until melted. Stir in the cacao or cocoa powder and sweetener. Taste and add more cocoa or sweetener to taste. 4. Take your almond butter eggs out of the freezer and using a spoon, dip them one at a time into the chocolate sauce. The chocolate will start to harden on contact. Transfer the coated eggs back to the parchment paper and place back in the freezer. After a few minutes, you can repeat the process, if you’d like a thicker chocolate coating. Sprinkle a few grains of course himalayan salt on each egg immediately after adding the last layer. Nut Free Substitution – I didn’t try it, because I didn’t have any on hand, but I bet sunflower butter and sunflower seeds would be a yummy nut-free substitution for the filling. 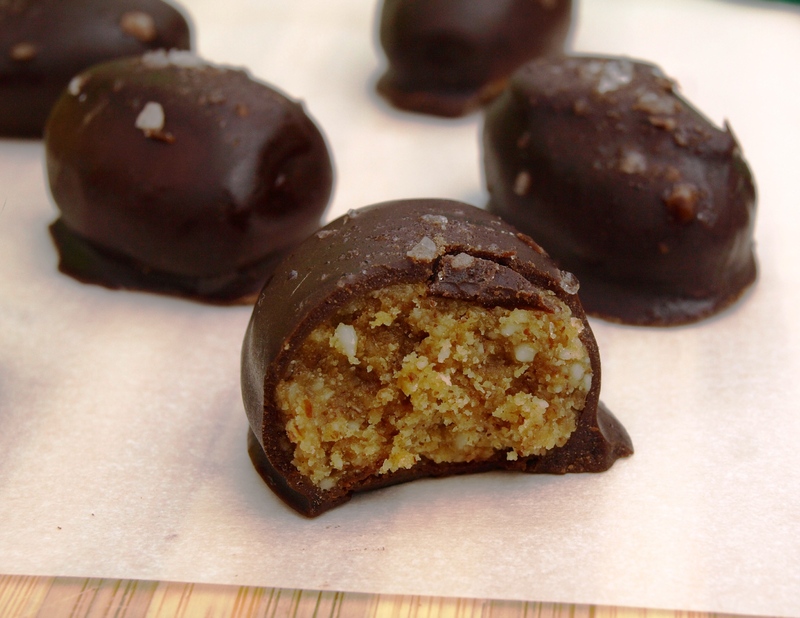 These look divine…if I make them do I have to share?! Haha absolutely not! I won’t tell 😉 and thank you, they really are delightful… Enjoy! Omg this sounds so yummy! I love chocolate and PB!! Peanut butter and chocolate, best combination of all time! But almond butter and chocolate isn’t too shabby either 🙂 Either way you go, I think you’ll love these! haha, yeah, any nut butter + chocolate combo is fine with me!! These little eggs sound divine! !